“North Dakota’s oil regulator (Lynn Helms) is planning to sue the state of Washington if it goes ahead with a proposal to reduce the volatility of Bakken crude oil transported by rail, saying it is not supported by science and would devalue the product.” — The Columbian. “Helms also wants the North Dakota Legislature to add $500,000 to a litigation fund so North Dakota can go to court if Washington approves the bill.” — Bismarck Tribune. What? Those stupid leaf eaters can’t put up with a few explosions for the betterment of Harold Hamm and other big deals? Do you think Harold backed the NDGOP and served as Kevin Cramer’s finance chairman on Cramer’s U.S.Senate campaign to take crap from some micro-brewed collmottlers? The Washington state lawmakers want the vapor pressure of the Bakken crude that rolls between the Mariner’s ballpark and the Seahawks stadium to be at 9.0 or under. Please. Is North Dakota going to just comply with what the Washington legislation asks as Bakken producers comply with the vapor pressure demands set by pipelines? Will a pelican give you a fish? Of course not. It’s a well-known fact that pelicans don’t share fish. “… according to Jeff Hume, chairman of the North Dakota Petroleum Council, Bakken producers would not be able to comply with the Washington law without purchasing costly stabilization equipment and forcing them to remove propane, butane and other components valued by refiners from their crude streams in order to fall below the 9 psi threshold. The industry of North Dakota will not adapt to this legislation without serious consideration of market demand and legal recourse,’ Hume said during a March 19 hearing before the state House Environment and Energy Committee.” — S&P Global Platts. See? Maybe they should have done things properly at the beginning. The consequences of indifference to human life should have corrected in 2008, at the latest. Eleven years ago. And did you notice something? Who else is complaining to the state of Washington about a 9.0 vapor pressure law? No one because the oil trains that originate in their states don’t explode. Not a super-high bar. There are some easy tips on how to send oil trains across state lines that don’t explode, but nobody in North Dakota even mildly important is willing to tell the North Dakota Petroleum Council members to do it. Jeff Hume explained exactly what needed to be done above. So, they’re going to pretend that Bakken oil trains don’t explode and keep covering up the first Bakken fireball in 2008. According to publicly available reports from both agencies, a BNSF Railway freight train that derailed in Luther, Okla., in August 2008 was carrying eight cars of crude from the Bakken region. The reports show that five of the derailed cars caught fire. “Local TV news footage available on YouTube shows black smoke pouring from the scene in a rural area about 30 miles northeast of Oklahoma City. At one point, a large explosion sends a massive fireball hundreds of feet into the air.” — McClatchey. The next derailment, five years later, on July 6, 2013, killed 47 people in an explosive manner who were minding their own business in Lac-Megantic, Quebec. The Bakken railroad explosions spiked after that tragedy and then leveled of when oil prices fell. The most recent “derailment explosion fire” took place in Mosier, Ore., in the Columbia River Gorge on June 3, 2016. The daily winds weren’t whipping down the gorge that day. Normally high wind speeds might have set the town on fire. This one spooked a lot of people in the northwest and California. 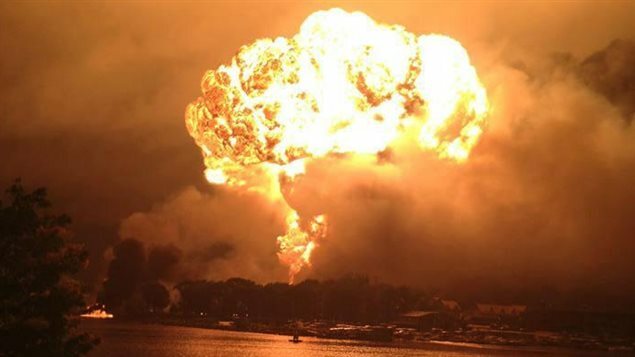 Most of us have seen at least one video or photo of the many Bakken oil train explosion images available. Lots of evidence. And we’re going to sue THEM? Observation is all the science Washington needs. Millions of people have seen Bakken oil tankers explode. Call your next witness. We know the old tankers and the new tankers allow breaches. We know that slow speeds don’t keep a derailed oil tankers from being breached. Then all you need is a spark for the Bakken concoction of explosive gases and crude to ignite. Oh, you’ve lost jury. That didn’t take long. Two lobbyists walk into a bar. Lobbyist One says, “You cannot make crude oil a nonflammable liquid. You have to make sure it’s in a robust rail car, that there’s speed restrictions, track maintenance and track inspections.” — Kari Cutting, North Dakota Petroleum Council. Auers is an executive vice president at Turner Mason and Co., an energy consulting firm that wrote, “The North Dakota Petroleum Council Study on Bakken Crude Properties” report for the North Dakota Petroleum Council. — Congressional Testimony, April 9, 2014. Cutting was there. And we’re going to sue THEM? Besides, Lobbyist One, just flammable would be nice. Can you at least get the towering mushroom clouds under control, please? Moving on, they’ll go down the “similar” road again. Lobbyist Two’s study found Bakken crude led to similar scientific results as other crude oil, except trainloads of it tend to blow up. But the explosions aren’t scientific, don’t you see? “If the legislation is approved by the state House of Representatives and signed into law by Governor Jay Inslee, North Dakota crudes currently shipped by rail into Washington would be replaced by shipments of similar crudes from Wyoming, Colorado, Texas and New Mexico,” Hume, the chairman of the North Dakota Petroleum Council said. “There would be no appreciable difference in composition and no difference in Transportation safety,” Hume said.” — S&P Global Platts. The most appreciable difference to me is that only the North Dakota ones explode. “Separately, the North Dakota Petroleum Council commissioned a similar kind of study to the DOT study. While both the government and industry studies led to similar scientific results, the NDPC study concluded that Bakken crude is no more volatile, again, no more volatile than other types of light sweet crudes.” — Rep. Paul Broun, Chairman of the Subcommittee on Oversight, Committee on Science, Space, and Technology. And the Ford Pinto was no more volatile than the AMC Gremlin until the Pinto’s kept exploding. Nobody said that we should keep buying Pintos and driving them to Washington. And yes, it’s that Congressman Broun. The one on the Science Committee with the fellow science genius N.D. Rep. Kevin Cramer. “And I — when I look and see how people in North Dakota are living now and what this means to people–ordinary people’s lives, again, you should be thanking God rather than sending out an army of regulators to try to find — and using a microscope to find out any excuse to put a roadblock in the way and try to stop this wonderful gift that we have from being utilized to upgrading people’s lives in our country. So that is the number one point.” — Rep. Dana Rohrabacher Subcommittee on Energy and Subcommittee on Oversight, Committee on Science, Space, and Technology. Yeah, we were eating dirt in North Dakota before big oil came back and you sure don’t need a microscope or a telescope to see a Bakken blast. “My comment on dinosaur flatulence and climate change (which was part of a question to a witness during a committee hearing) was a lighthearted poke at global warming activists who have gone so far as to blame cow farts. Reporting it as serious actually makes my point about the humorless fanaticism of these activists.” — Congressman Rohrabacher, LA Times. Then, the lobbyists and North Dakota did a nice job of teaching this “we did something” lie to the media. “North Dakota regulations that took effect in 2015 require companies to remove the most volatile gases from Bakken crude oil to ensure the vapor pressure doesn’t exceed 13.7 pounds per square inch.” — Bismarck Tribune. They remove no such thing. No most or any other amount of volatile gases are being removed. The vapor pressure rarely even hits 13.7 and Jeff Hume, chairman of the North Dakota Petroleum Council admits it. And we’re going to sue THEM? “Mr. Auers. ‘But typically Bakken, from an RVP standpoint, will be 8 to 12 pounds from a true vapor pressure standpoint, 9 to 13 pounds. '” — Also congressional testimony. In May 2014 in Bismarck, at the Williston Basin Petroleum Conference, the North Dakota Petroleum Council presented the Turner Mason Report, which stated the vapor pressure of Bakken crude to be 7.83, and we’re going to sue THEM for wanting a 9.0? Where’s the science that determined the number 13.7? I understand that after torturous thought, the N.D. Industrial Commission subtracted 1.0 from 14.7, which for some reason is the national standard. Maybe the “LG 14.7-cu ft Bottom-Freezer Refrigerator with Ice Maker” was the muse. Subtract 1.0 and call it a day. The same bad things will happen. Subtract 2.0 and see if the death projections go down. North Dakota shouldn’t be involved in private business for one thing. Is the state responsible for Harold Hamm’s money? Are big oil and North Dakota one and the same now? Don’t they have their own lawyers? Secondly, are N.D. citizens going to pay billions for more death and destruction when a chunk of Seattle goes up in smoke? Or are N.D. citizens in Harvey expected to pay with their own lives? Is North Dakota seriously going to keep backing companies that put more people in danger, because of money? And when N.D. loses this court case because its wrong, how many other states will decide to litigate on behalf of the lives of their people? Vendors will deliver right to the well site. It’s not like there’s no way to get stabilizers here. Some oil people just don’t want to write a big check and North Dakota doesn’t want the oil companies to invest in proper equipment and infrastructure, for some reason. Which Jeff Hume, chairman of the North Dakota Petroleum Council admitted a few weeks ago. Why would it be the Department of Mineral Resources resources to do the suing? Don’t the three members of the Industrial Commission want to get their fingers all sticky? “Lynn Helms, the state’s top oil and gas regulator, said the North Dakota’s Attorney General and Industrial Commission plans to sue Washington under the Interstate Commerce Clause if the House passes the bill and Governor Jay Inslee signs it into law.” — S&P Global Platts. Sue THEM, when our leaders did THIS in 2014, just as Railway Age predicted. This conditioning lowers the ignition temperature of crude oil — but not by much. It leaves in solution most of the culprit gases, including butane and propane. Even the industry itself says conditioning would not make Bakken crude meaningfully safer for transportation, though it would make the state’s crude more consistent from one well to another. Which Jeff Hume, chairman of the North Dakota Petroleum Council, admitted a few weeks ago. But Kevin Cramer said the explosions were safe, which eased my mind like a mallet to the temple. “Cramer said after 10 years on North Dakota’s Public Service Commission, he was confident the state’s oil was safe.” — The Minot Daily News September 12, 2014. Representative oil shill was so confident but so wrong. Like you said, Is the State of ND going to keep backing companies that put people’s lives in danger for money?? That was the best said in the whole piece. All the ducking and dodging doesn’t change a thing.